Kentucky Fried Chicken (KFC) has denied that there has been a drastic increase in the price of its items. In a statement to Malaysiakini, Mohamed Azahari Mohamed Kamil, the managing director of QSR Brands (M) Holdings Berhad which owns the fast-food franchise, said the slight increase in price was the result of the sales and services tax (SST) being factored in. "We wish to clarify that starting from December 2018, our listed prices are inclusive of six percent SST. There are some marginal adjustments to the price of our products to ensure we are able to continue providing our customers with the same quality, finger-licking good chicken without compromise. "To this end, we hope our customers understand our menu has been specially put together to offer value for money options that cater to the different needs of our customers," said Mohamed Azahari. The fast-food giant was responding to a viral post on Facebook yesterday which said that a KFC outlet in Perlis had drastically bumped up the prices of its menu items. 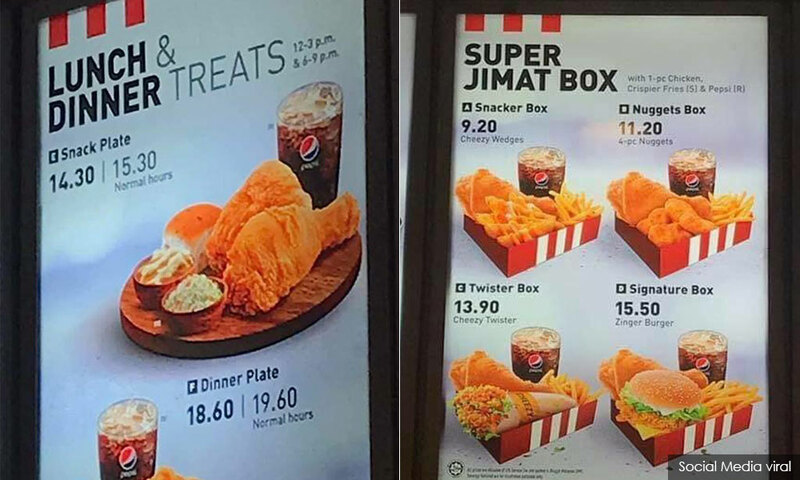 According to the post, the price of a KFC Snack Plate had increased from RM12.30 to RM15.30 while the Dinner Plate set had gone up to RM19.60 from RM15.60. Netizens lamented that the prices were much higher than from the Goods and Services Tax (GST) era and that they now could not afford KFC meals, especially when in large groups or families. In reference to this, Mohamed Azahari clarified that the prices shown in the viral post were, in fact, from several years ago. Meanwhile, Utusan Malaysia quoted Perlis Domestic Trade, Cooperatives and Consumerism Ministry (KPDNKK) enforcement chief Mohd Sakhri Mohd Salleh as saying that the said outlet has been ordered to issue a clarification within five days. "This is important so that we know the cause of the price increase which is seen as unreasonable. "We conducted checks on KFC restaurants following the implementation of the SST last September and found that price increases then were under control and not excessive," he was quoted saying after conducting a spot check at a mall in Arau, Perlis.